Each pendant is an original design that germinates in the artist's daydreams. 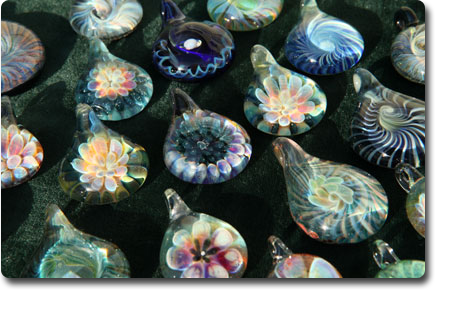 Every piece begins as either a tube or rod of clear glass, is built up, and transformed into gorgeous pieces. Simple dots and stripes, when layered and tastefully worked, are manifested in the artist's hands. The result is eye catching treasured mementos to be worn and admired. All pendants come finished on a high quality, adjustable leather cord. ©2011 Natural Reflections Glass. All rights reserved.